The mother and grandmother (pictured, right) of a six-month-old baby who was mauled to death by an American pitbull have been jailed. The dog, named Bruiser, picked up Molly Mae Wotherspoon by her head and launched a "sustained attack" at her home in Daventry on October 3, 2014. The child suffered a catalogue of injuries including a fractured skull and bites to all four limbs, and died of blood loss. 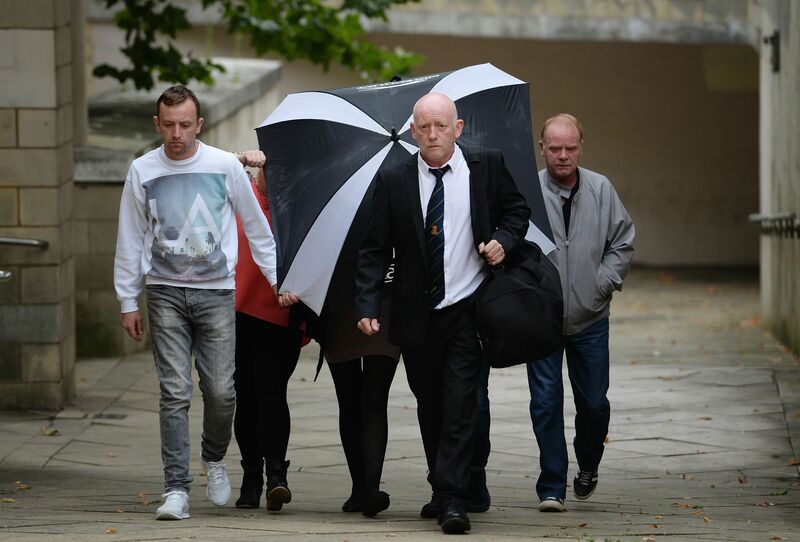 Northampton Crown Court heard that Molly Mae was being looked after by 56 year-old Susan Aucott while her mother Claire Riley, 23 (pictured, hidden by umbrella), went for a night out with friends. The dog escaped from its cage in the kitchen and opened the door to the living room, where Molly Mae was on the changing mat. Prosecuting, James House said: "He was an aggressive and dangerous dog and should not have been left in the house with a person who could not control him. One vet who had previously seen Bruiser described him as "one of the most aggressive dogs she had ever seen", Mr House added. Aucott, who admitted being in charge of a dangerously out of control dog, was sentenced to two years in prison. Riley, also of Northampton, was sentenced to two years in prison after admitting owning a dangerously out of control dog. Mrs Justice Carr QC said: "This was a tragic and totally avoidable incident." "Molly Mae's death was a tragedy for all concerned. Sadly, the simple truth is that her death in October 2014 was entirely avoidable. Molly Mae's death would not have happened if two of the people closest to her had acted, as any reasonable person would have done, and never allowed such an aggressive and dangerous dog to be in the same small house as a young and vulnerable child."